Martin Conway: 'The beginning of a misunderstanding? 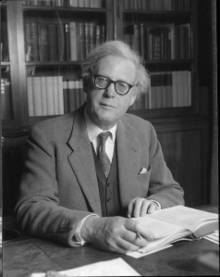 Hugh Trevor-Roper and the making of post-war Europe'. Harris Lecture Theatre, Oriel College Oxford, Friday 12 May, 5 p.m.
Hugh Trevor-Roper. The Historian edited by Blair Worden (published by I.B. Tauris, February 2016). With essays by Rory Allan, John Banville, Sir John Elliott, Mark Greengrass, E.D.R. Harrison, Colin Kidd, Sir Noel Malcolm, Simon Malloch, Richard Overy, John Robertson, Gina Thomas, Blair Worden, Brian Young. Hugh Redwald Trevor-Roper, who became a life peer as Lord Dacre of Glanton in 1989, was born on 15 January 1914. The son of a country doctor in Northumberland, he was educated at Charterhouse and then at Christ Church, Oxford, where he read first for a degree in Classics and then for one in History. He became a Research Fellow of Merton College Oxford in 1938. During the second World War he was an intelligence officer. In 1946 he returned to Christ Church as a Student, where he remained until 1957 when he became Regius Professor of Modern History, a post he held until 1980. From 1980 to 1987 he was Master of Peterhouse, Cambridge. He died on 26 January 2003. His books were The Last Days of Hitler (1947); Historical Essays (1957);Religion, The Reformation and Social Change (1967); The European Witch-Craze of the Sixteenth and Seventeenth Centuries (1970); Princes and Artists (1976); A Hidden Life (1976; also published as The Hermit of Peking);Renaissance Essays (1985); Catholics, Anglicans and Puritans (1987); From Counter-Reformation to Glorious Revolution (1987). Seven books have appeared posthumously: Letters from Oxford (2006); Europe’s Physician. The Various Life of Sir Theodore Mayerne (2006); The Invention of Scotland (2008); History and the Enlightenment (2010); The Wartime Journals (2012); The Secret World. Behind the Curtain of British Intellignce in World War II and the Cold War (2014); One Hundred Letters from Hugh Trevor-Roper (2014).